Hard drive platters can retain data long after you think you've eradicated it. Getting rid of old computer files serves two purposes: it frees up disk space for reuse and, theoretically, permanently eliminates access to old documents and data. The realities of deletion and erasure mean that this simple view of the goals and results of file eradication don't depict what really happens when you try to remove material from your system. In fact, many of these methods only hide your old files rather than actually eradicating them. When a file becomes sufficiently out of date to offer no archival value, you can consign the document to your Recycle Bin or Trash on Microsoft Windows and OS X, respectively. Trashing a file doesn't remove it from your hard drive. 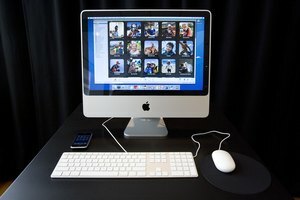 If you've ever accidentally deleted the wrong document and fished it out just before emptying your computer trash, you know that you can reverse the first step in the deletion process with ease -- as long as you haven't set up your system to get rid of files the moment you trash them. The act of emptying your Recycle Bin or Trash tells your OS that it can reclaim the space occupied by deleted files for use with new data. Until new information takes over that disk space, the information you deleted remains recoverable. If you write a smaller file onto the space occupied by a larger one, part of the deleted document remains. Because hard drives store data in chunks of fixed sizes, most documents include slack space, a small amount of unused storage after the active data and before the file's allocated size. Information from deleted files can remain accessible in slack space. Erasing a hard drive before you reinstall your operating system doesn't necessarily get rid of the information on the disk, but it takes a step closer to that eventuality than simple deletion does. When you issue an erasure command in a disk formatting program, you get rid of the hidden files that tell your OS how you partitioned your drive. This step can prepare the drive for reuse, but it doesn't actually remove the data from the storage mechanism. To give this procedure a more secure result, you can opt for erasure steps that replace drive information with random data or a repeated pattern of ones or zeroes. The U.S. Department of Defense standard mandates three overwriting passes, each time with a different character. This overwrites the data but may leave information that can be retrieved under an electron microscope. 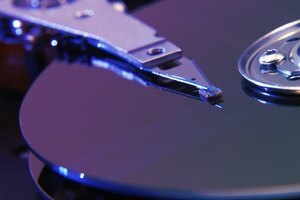 Secure, confidential, proprietary and secret information can require special measures to protect it from retrieval after a company or government agency decommissions a computer or its hard drive. These methods can include the application of a powerful electromagnet to scramble the data stored on a drive's platters. This procedure uses the same principle of demagnetization applied to erase audio tapes through a process called degaussing. In conditions of the utmost security, old drives proceed from degaussing to physical destruction. These final steps smash its platters into pieces so small as to be unrecoverable or douse the drive in acid. Solid state drives mark a new, diskless, speedy alternative to conventional hard drives. Because these devices rely on flash memory instead of rotating platters, they come with different specifications for how to erase them. Repeated use of a single portion of the storage area on these media causes it to wear. As a result, these drives use special technologies designed to avoid writing data to the same spots over and over, preserving their viability. Because erasing techniques rely on exactly the process these drives try to prevent, users may opt for whole-disk encryption instead of erasure. Without the decryption key or password, you -- or someone who acquires the drive after you discard it -- can't access your data. Mott, Elizabeth. "What Is the Difference Between Deleting & Erasing Information on a Hard Drive?" Synonym, https://classroom.synonym.com/difference-between-deleting-erasing-information-hard-drive-15461.html. Accessed 24 April 2019.